Application forms will be distributed during the event. 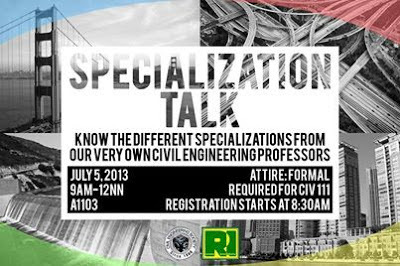 This talk will also include a software seminar that will be beneficial for all CE students. To achieve a 100% passing percentage in the CE Licensure Exams is one of the goals of the University. To realize this goal, the CE Department started its CIV Pre-Board Exan 101 this term for all students undergoing practicum. The Department aims a "101" performance meaning 100% passing and No. 1 School in the CE Board Exams. The diagnostic tests are aimed to assess the level of stock knowledge and degree of preparation of the students for the CE Licensure Exams which are held every November and May. Knowing the students' weaknesses in the tests will guide them on where to concentrate their review. 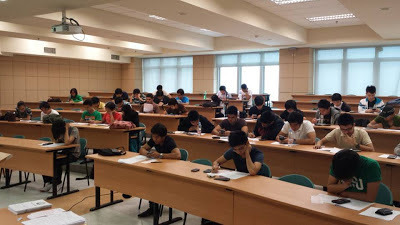 The first set of exams is scheduled this first term AY 2013-2014.There are three tests: (a) Math and Surveying : June 22, 2013, (b) Geotechnical, Hydraulics and Transportation: July 13, 2013, (c) Structural and Construction Engineering: July 27, 2013. The test coordinators for this program are Dr. Alexis Filone (Math/Surveying). 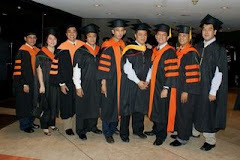 Dr. Renan Tanhueco (Hydraulics/Transportation/Geotechnical) and Alden Paul Balili (Structural/Construction). DLSU got a 100% passing rate in the CE Board exams on May 1998 (National Passing: 35.78%) and November 2001 (National Passing: 35.42%). The lowest passing rate of DLSU was 60% vs a National Passing percentage of 36.43% on May 1995. 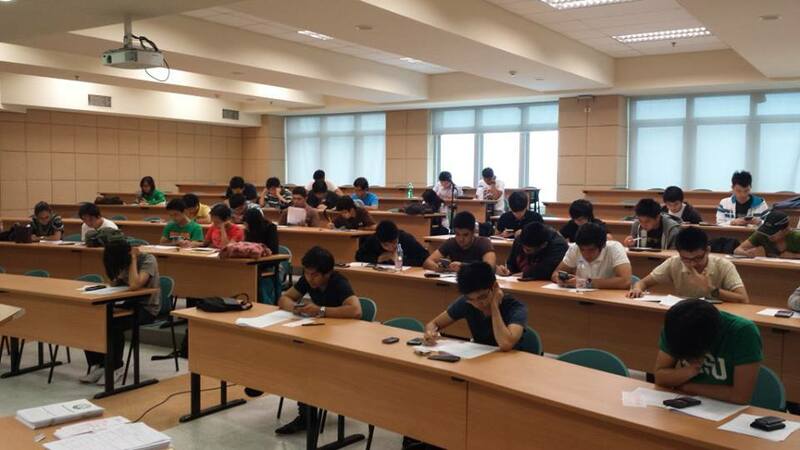 In the latest CE Board exam on May 2013, DLSU's passing percentage was 98.46% or 64/65 vs a National Passing: 42.82%. This latest passing percentage is DLSU's 2nd highest passing percentage after 100%. DLSU consistently had a passing percentage relatively above the National passing percentage. 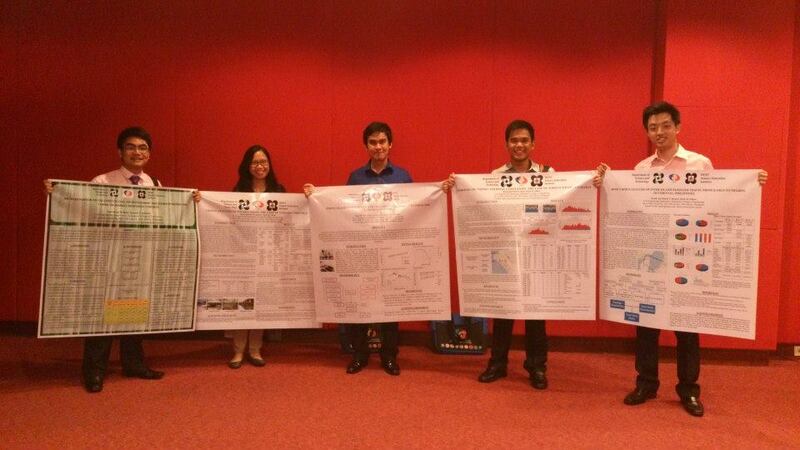 The CIV Pre-Board Diagnostic Tests 101 Program is a voluntary service of the Department for the graduating students. No fee is charged. CTMTREP - Entrepreneurship for Engineers is a specialization course in the Construction Technology and Management (CTM). The course is designed to introduce the upper level undergraduate students to the concepts and practices of entrepreneurial thinking. Using a combination of lectures, case studies, student led discussions, team business plans, and investor presentation formats, the course teaches life skills in entrepreneurial thought and action that student can utilize in careers ranging from starting companies to intrapreneurship, Idea Generation and Feasibility Analysis, and Business Planning. 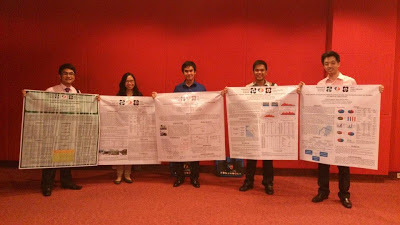 Six Civil Engineering Graduate students (one MSCE and five BSMS students) presented their respective researches as posters at the 2nd Engineering Research and Development for Technology (ERDT) Congress at the Philippine International Convention Center last Friday, June 14. The congress had the theme of “K2M: Knowledge to Market (Engineering to Enterprise)”, included a series of plenary talks by experts on innovation, renowned professors, and ERDT scholars who have successfully established their own businesses. The congress aims to provide discussions in order to produce and commercialize innovative ideas. The ERDT is a highly funded development project by the Philippine government through the Department of Science and Technology. Engr. 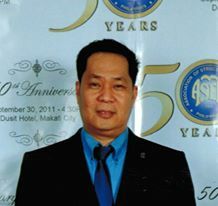 Adam C. Abinales, president of the Association of Structural Engineers of the Philippines (ASEP) in 2011-2012 and one of the ASEP 50 Outstanding Structural Engineers and PICE 75 Filipino Outstanding Civil Engineers (FOCE) joined DLSU Civil Engineering Department as a part time teaching faculty in 2012. 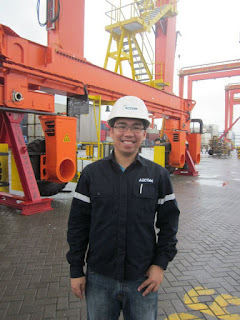 Abinales has a Masters of Engineering degree in Civil Engineering (Major in Structural Engineering) from Adamson University and a BSCE degree from Mapua Institute of Technology. Abinales runs his own consulting firm as principal of Adam Abinales Engineering and Consultancy. With his broad experience in structural engineering - serving as consultant of SMART Communications, Ic., PLDT, BAYANTEL, ERICSSON, BELLTEL, ABC5, GMA7, Manila Water, Inc.etc., Abinales was tasked to teach specialization courses in structural engineering. He handles courses in Bridge Engineering, Prestressed Design, Earthquake Engineering and Structural Design of Buildings. 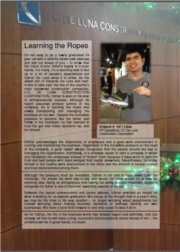 Rodolfo P. Mendoza Jr. was one of the undergraduate BSCE students of the former Don Honorio Ventura College of Arts and Trade (DHVCAT) now DHVTSU - an "adopted" CE school of DLSU College of Engineering under the "Adopt-an-Engg-School Program" of COE. He is now teaching part time at DLSU CE Department starting AY 2013-2014. Before joining DLSU, Mendoza has more than 4 years of experience in the Structural Engineering and Consulting Profession. He was involved in various structural and infrastructure engineering projects such as design, analysis and assessment of marine structures which include wharves, piers, seawalls, mooring dolphins and revetments. He also has an extensive experience in the analysis and design of low to mid-rise buildings such as shopping malls, hospitals, condominiums and commercial centers. In addition, He was also involved in the design of wastewater structures like pump and lift stations. 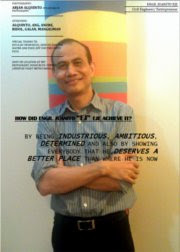 He was also involved in the design of ambitious development project in Malaysia which includes an iconic bridge structure. Currently, he is structural engineer for AECOM Philippines, the current No.1 Engineering Design Firm in the world based on ENR Records. He is a member of the International Association for Bridge and Structural Engineering (IABSE) and the Association of Structural Engineers of the Philippines (ASEP). 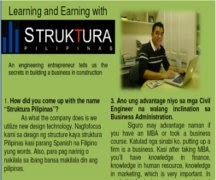 Mr. Mendoza holds a master’s degree in structural engineering from the Mapua Institute of Technology. His research work focused on the evaluation of the seismic effect of masonry walls in the performance of low-rise reinforced concrete frames. 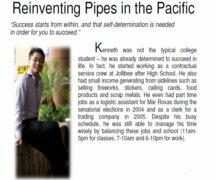 He took his Bachelor of Science in Civil Engineering from the Don Honorio Ventura Technological State University (DHVTSU) in Pampanga. Engr. 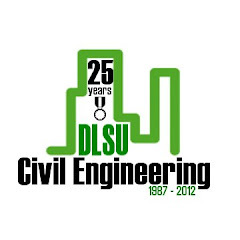 Mendoza ranked 2nd place in the November 2008 Licensure Examination for Civil Engineers with a GWA of 98.95%. 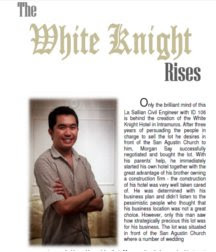 He was also awarded as the 3rd Most Outstanding Civil Engineering Student of the Philippines in 2007 (MOCES) by the Philippine Institute of Civil Engineers. 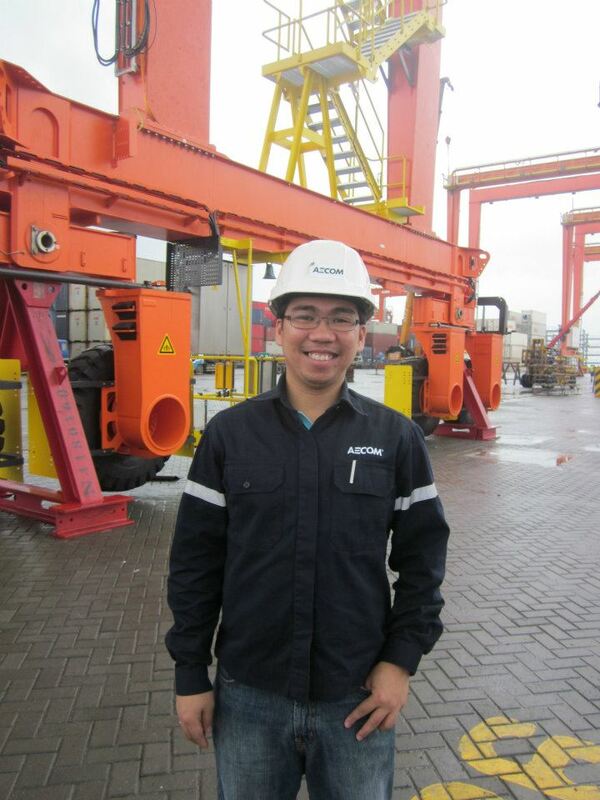 Lasallian BSCE alumnus,William Hong, Doctor of Engineering graduate of Tokyo Institute of Technology is now a part-time faculty member of the Civil Engineering Department starting AY2013-2014. He is now teaching elementary surveying to sophomores but in the future he will handle courses in construction management and economics and infrastructure development in the undergraduate and graduate program. 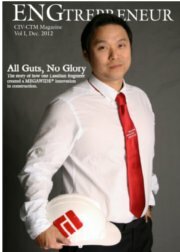 Dr. William Hong at the top of the world! 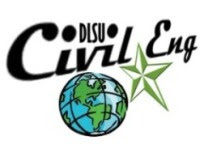 You know that slogan of DLSU, the future begins here? Well, its true! 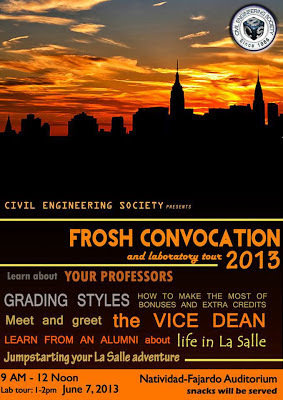 My La Salle journey started in year 2001 as a civil engineering frosh. After graduating 4.5 years later, I thought that would be the end of my DLSU journey and the beginning of the "real world", as many would say. Or was it? Sometime soon after graduating, I was called by my DLSU mentor for a scholarship offer to Tokyo Institute of Technology, Japan. I was not sure what that path would hold for me, but it seemed promising. Two gruelling years later I would finish my Masters in International Development Engineering (IDE) with specialization in concrete and steel durability. I found myself becoming more and more engrossed in the academic and research world. I would be reading books, writing journal papers, and conversing with sophisticated individuals with sophisticated thoughts. What kind of future was this? I pushed on anyway. Three more years later I would attain a Doctor of Engineering degree, still in the IDE Department, in the field of resources and energy economics. I felt like I was on top of the world. The picture I posted here was the time I climbed Mount Fuji. It is a destination you aspire for and work hard for. But when you are on top, you do not really stay there for long. You have to go down again and live the life you had when you started. What you can do, however, is to share what you saw from the top. It seemed evident to me that the experiences I had gone through in Japan were not to be kept only for myself. It had to be shared to those that would need it and would also share it back. I simply found myself strolling down a path that would lead me back to where the journey began. 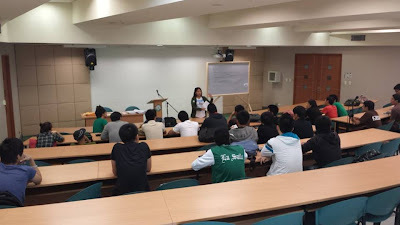 A dozen years after starting my future here in DLSU, I find myself back. Back to start again. Back to share. Back to realize that the future is really where you begin it. To my dear students and friends, enjoy your years here while it lasts. The future is here and it is what you make of it. The CE Lab tour will follow at 1:00 PM. 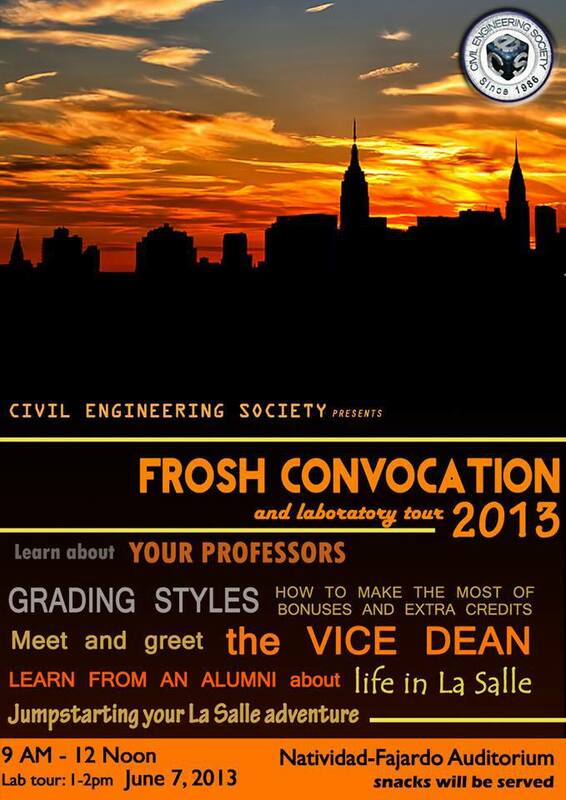 Welcome CE Froshies. Animo Lasalle!